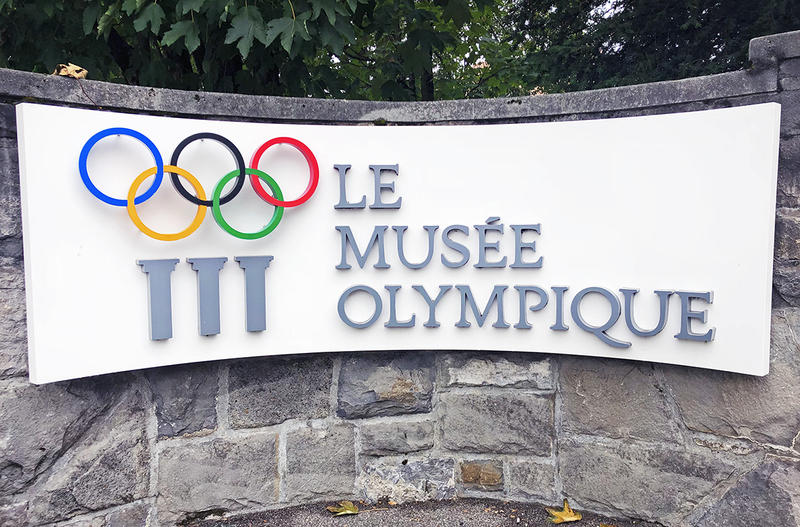 The Olympic Museum (Musée Olympique) located in Lausanne, Switzerland houses permanent and temporary exhibits relating to sport and the Olympic movement. With more than 10,000 artifacts, the museum is the largest archive of Olympic Games in the world! The Olympic Museum Lausanne is located on Quay d’Ouchy, across Lake Geneva. The Olympic Movement and the International Olympic Committee were formed on June 23, 1894 by Pierre de Coubertin. The Olympic Movement comprises the IOC, the International Sports Federations (Ifs), the National Olympic Committees (NOCs), The Organizing Committees for the Olympic Games (OCOGs). The origin of sporting competitions in ancient Greece is not known for certain. It is possible that they stemmed – particularly the chariot race – from funeral games organized in honor of warriors killed in combat. Writers of ancient times attribute their creation to various heroes. In Homer’s “Iliad”, Achilles organized jousting competitions in Troy to pay homage to his beloved deceased friend Patroclus. The poet Pindar (5th century BC) discusses the role of Heracles following the fifth of his Twelve Labors. To punish King Augeas for not keeping his word, Heracles took his city Elis, and founded the Games close to the tomb of Pelops (the Pelopion) in honor of his father Zeus. 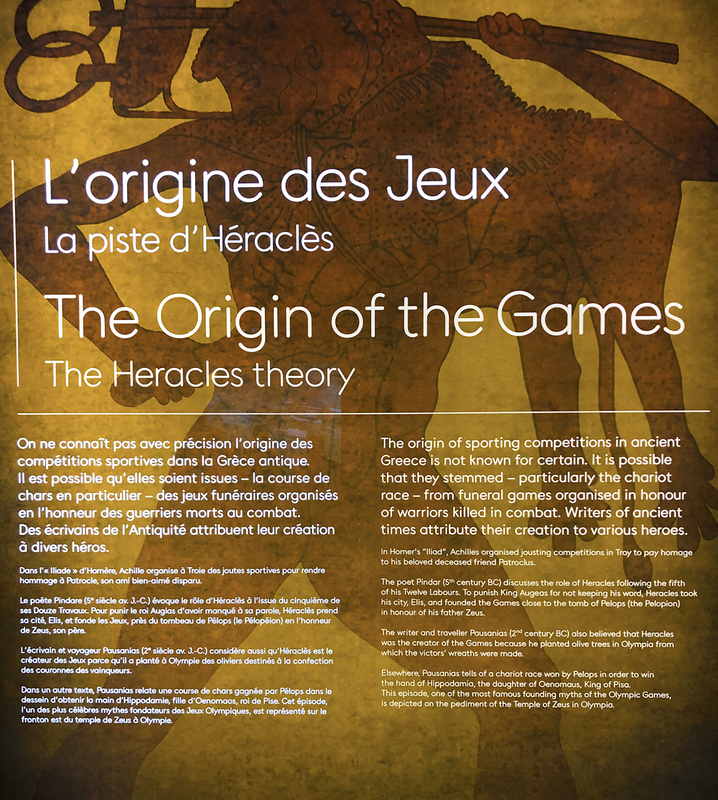 According to a written source, the Games were held in 776 BC, but they most probably existed before that. The Games were organized in Olympia every four years, with a sacred truce imposing peace for the duration of the competition . Messengers travelled from city to city announcing the competition dates. A crowd of 40,000 people consisting of athletes, spectators and merchants, travelled safely to and from the venue of the Olympics. 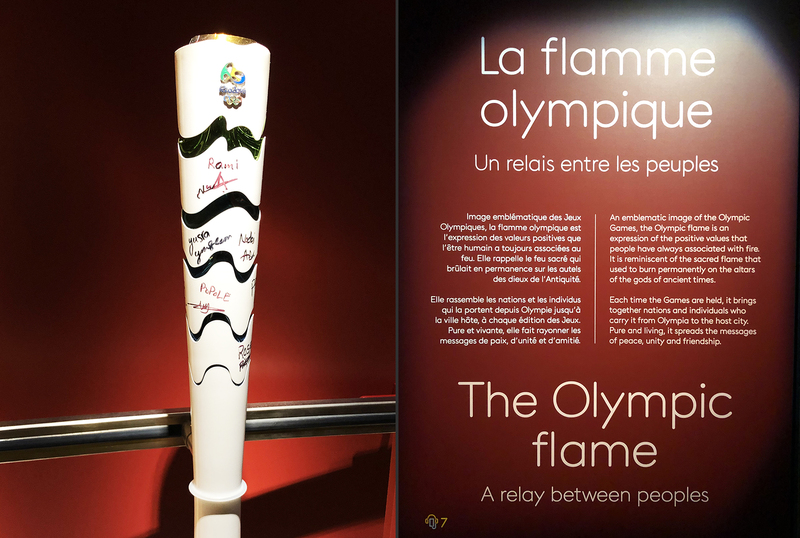 An emblematic image of the Olympic Games, the Olympic flame is an expression of te positive values that people have always associated with hfire. It is reminiscent of te sacred flame that used to burn permanently on the altars of the gods of ancient times. Each time the Games are held, it brings together nations and individuals who carry it from Olympia to the host city. Pure and living, it spreads the messages of peace, unity and friendship. The participation of refugee athletes at the Olympic Games in Rio (2016) was a collaborative process between the IOC, the National Olympic Committees, the International Federations, and the athletes with refugee status. You can see signatures on the Rio 2016 Olympic torch by Syrian swimmers Rami Anis and Yusra Mardini. 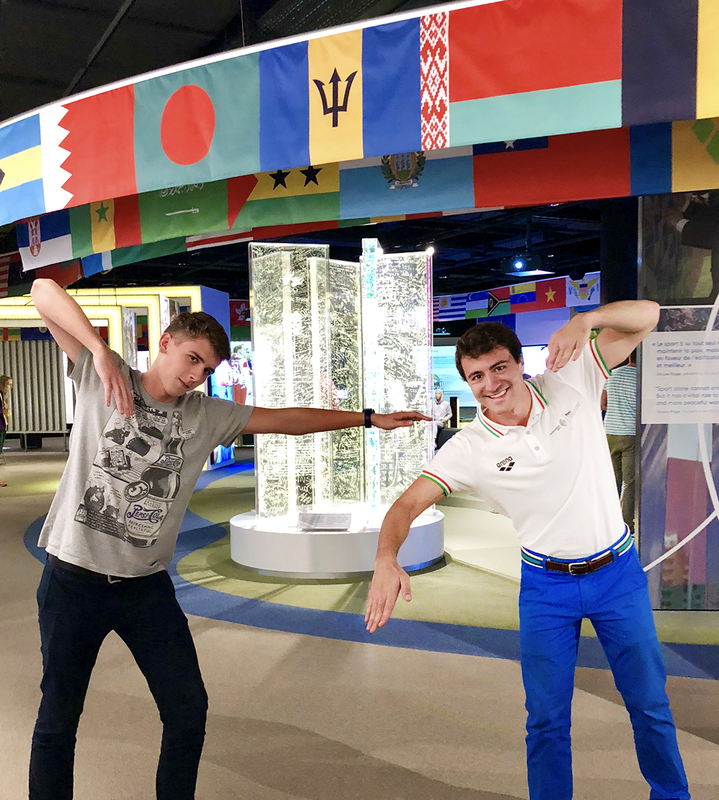 Before you even enter the Museum, you’re welcomed by grand statues and the iconic Olympic Rings in multiple locations. Once you’re in the Museum you’ll drop your belongings (backpack, jacket, etc) in the locker room. Similar to the FIFA World Museum in Zurich, each locker has an iconic Olympic athlete’s name on it. 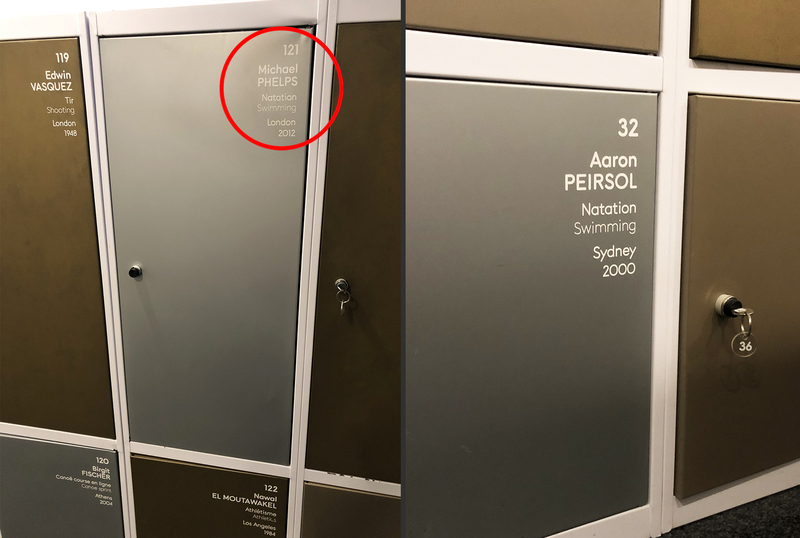 I stored my backpack in Aaron Peirsol‘s locker – how cool is that!! The history of the Olympic movement is inspiring and the artifacts presented are equally cool. Each Olympic sport had specific articles of clothing and equipment from Olympic legends. 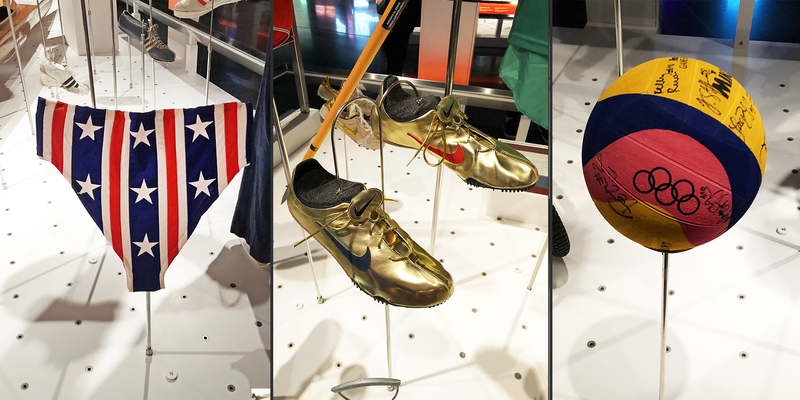 Checkout this replica swim suit of Olympic swimmer Mark Spitz and running shoes by Michael Johnson! 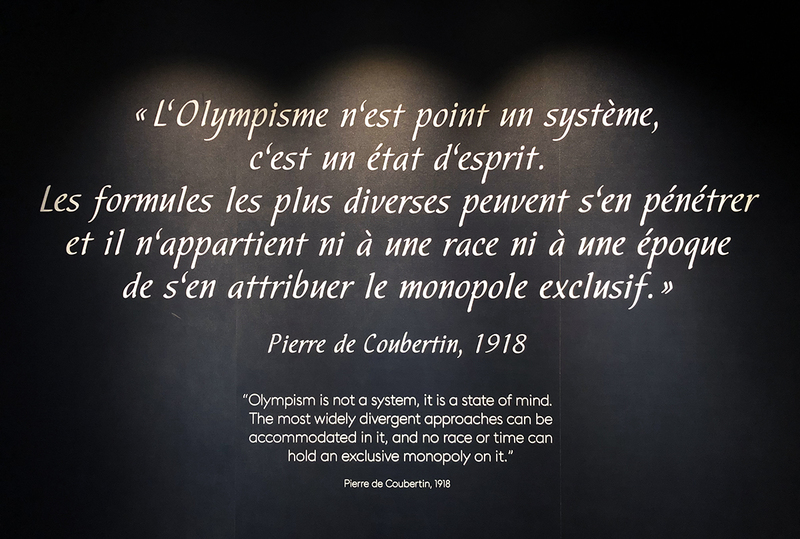 Pierre de Coubertin conceived the Olympic Games as an international event. This vision was achieved in Stockholm in 1912: for the first time, competitors from all five continents took part in the Olympic Games. The Games are an assembly of countries, men and womeon from all walks of life, driven by one and the same ideal. Present in all five continents, the Olympic Movement is a witness of its time. Born out of the dream of one man, today it brings together more than 200 NOC’s and 4+ billion people. Two thirds of the planet watched the Opening Ceremony of the 2008 Beijing Olympic Games. More than 100 years later, a dream became a reality, uniting all of humanity with the same spirit and passion. Wile at the Olympic Museum I met a fellow swimmer from Poland, Arek. It’s amazing to meet people from all over the world who share the same passion for the water. 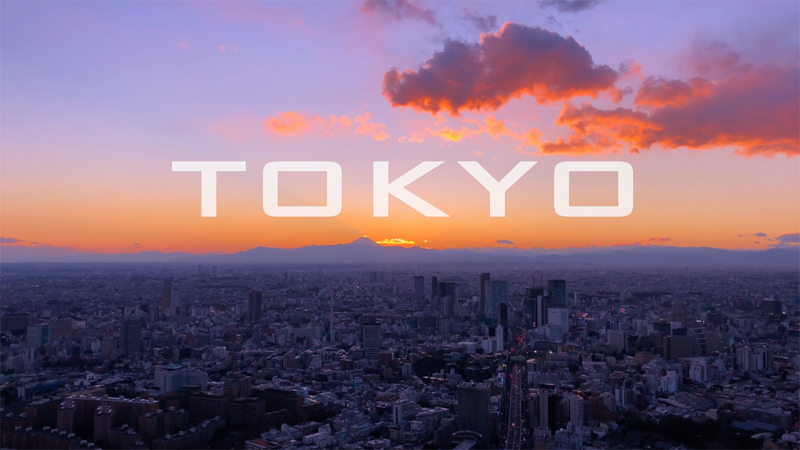 For every host city, the Olympic Games are an occasion to shine. It is also a great challenge because significant work is required to create, develop and modernize the infrastructure that will hold the event. The city implements its metamorphosis over seven years. This generally spectacular transformation encompasses everything that its concrete and symbolic identity is based on: Environment, topography, personality, architecture, territory, transportation, image, economy, and culture. Such renovation and development efforts have a global impact. By bringing each city to life with their symbols and imagination, the Olympic Games reveal them for all to see. Olympic cities leave a lasting transformation. 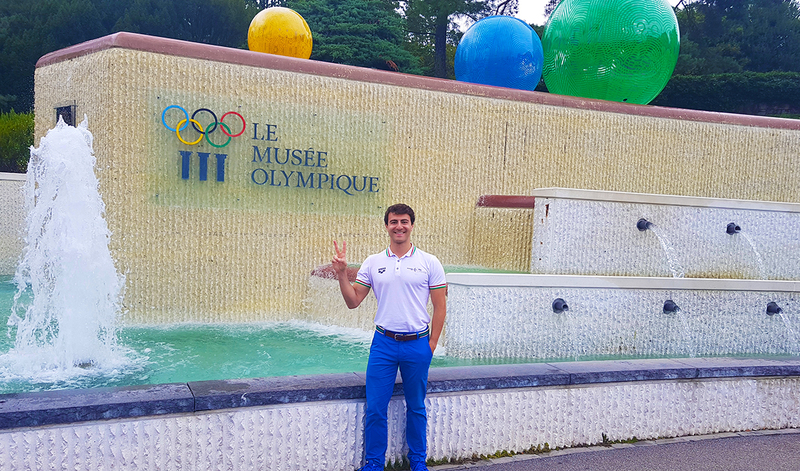 Have you had the opportunity to visit the Olympic Museum in Switzerland? Reach out and let me know fares@myswimpro.com. If you’re looking for a swim workout or training plan to help you reach your goals, checkout our app MySwimPro free for iPhone and Android.  Archived in Community. Bookmark the permalink.